Every week I receive a number of messages from freelance translators, offering their services. Most of those who send these messages usually fail to distinguish themselves, and fail to make any positive impression. I am [Name redacted] from Italy. 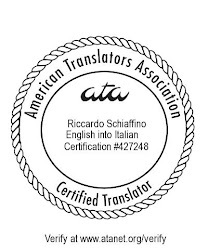 I am an Italian native experienced translator and proofreader. I translate from English to Italian and via versa. I have worked for several translation agencies, translating various fields, it would be a real pleasure for me working with you as freelance translator, so I am sending this cover letter and the enclosed resume to introduce myself and my skills and experiences to you. My rates are flexible and negotiable depend on the subject of the text and the urgency of the task. I look forward to working with you in the near future. Now: what's wrong with this? Generic salutation. It tells me this is part of a mass e-mail campaign (i.e., spam) and that is not addressed to me or to my company. A message with such a salutation most likely goes straight to the spam folder: If the writer cannot be bothered to address it to a specific person or at least to a specific company, why should the recipient be interested in reading it? English to Italian and vice versa. The writer says she is an Italian native, and claims to be able to translate not only from English into Italian, but also from Italian into English. Translating into a language you are not a native speaker of is usually the mark of the amateur. There are exceptions (such as people who are really native speakers of two languages, and even a few non-native speaker who do have the exceptional ability to translate into their second language at a level indistinguishable from a native speaker), but these are very few and far between. Various fields. The purpose of the cover letter is to entice me into opening the résumé. I might do so if the message indicates a specific field I'm interested in. "Various fields" tells me absolutely nothing. Skills and experiences. Again, a missed opportunity for distinguishing herself from all other wannabe translators. Which skills experiences? The message doesn't say, so once again I have no reason to open the résumé. Grammar errors. The writer claims to be able to translate into English, but then cannot even write correct English in her cover message. This not only undermines her credibility as an Italian into English translator: it also casts a shadow on her English into Italian skills. Remember: the main purpose of your message is to entice your prospect to open the attached resume, or to ask for more information. To do that you should distinguish yourself from other translators. Make your message stand out from the rest: indicate some specific skill or experience, address you message to a specific person, write in a way that clearly show you know your business. Great post. As an agency PM, this is basically a version of the checklist I go through when I receive these e-mails. Often I don't get that far, since there is sometimes a glaringly incorrect subject line or lack thereof. I've also learned to recognize the form letters that seem to repeat. The lack of experience has always been a conundrum: most agencies don't want to risk giving work to new translators without experience - and the new translators won't gain experience if they don't get work. 3) When someone answers (even just to tell you that you don't have enough experience), try to keep the conversation going: not immediately, perhaps, but send them a follow up message whenever something changes in your experience (or in other things you do professionally). Something as simple as "I wrote you some months ago and you were kind enough to answer me, though you noted I didn't have enough experience to work for you. In the meantime, I have completed several pro-bono projects for ...". I do believe this kind of applications doesn't come from real translators. It is very likely that it is a case of scam and identity theft. Unfortunately, it usually does come from real translators, or at least from people who honestly think they are real translators.